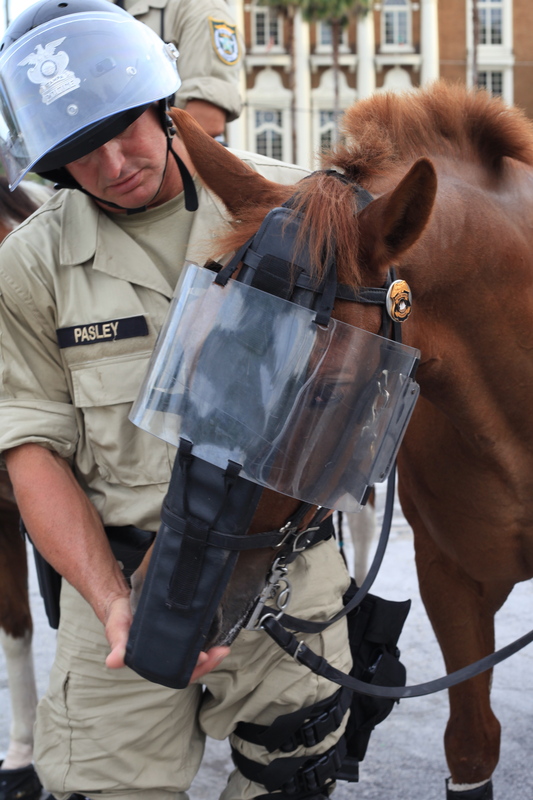 Categories: Canon 5D Mark II, Photography, Uncategorized | Tags: 52 Week Photo Challenge, Canon 5D Mark II, Mindy Towns Photography, Photography, Republican National Convention Protesters, Tampa, Tampa Mounted Police | Permalink. This tugs at your heart strings, doesn’t it? You’re right in that our media overlooks moments like this. Great moment & great post. Almost as good as the cops in Coyote Ugly. I will be looking for that photo on YOUR blog Larry! Wow…that is a tender moment. I never thought about the trauma a horse goes through. So much protective gear. That horse looks calm and protected! Great capture. any animal helping a human being seems so noble … what a lovely idea to take this photo. What a great moment to catch-love the look on both of their faces!